Ruby Corby O’Neill campaigns at a Newtown diner on Monday. 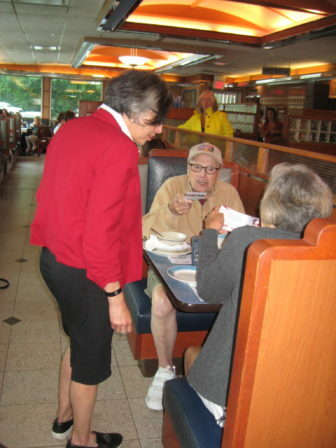 Newtown – In her last-minute search for votes, Ruby Corby O’Neill, a Republican hoping to win Tuesday’s primary for the 5th District congressional seat, made a tour of the district’s diners in search of votes, handing out flyers and introducing herself to potential voters. She also visited train stations, auto shops, and anywhere else she might find a potential Republican primary voter who could give her the edge in Tuesday’s election. Neither O’Neill nor Watertown businessman Rich DuPont, who is also running as a GOP candidate, are the endorsed Republican candidates in the race — that distinction went to former Meriden Mayor Manny Santos. Although she’s not her party’s official candidate, O’Neill is married to Rep. Arthur O’Neill, R-Southbury, and has been endorsed by some of her husband’s colleagues, including Reps. David Wilson R-Bethlehem, William Petit, R-Plainville, David Labriola, R-Naugatuck, and Tim LeGeyt, R-Avon. While fierce competition among the Democratic candidates for the seat — Jahana Hayes and Mary Glassman — has often overshadowed the Republican contest, the three GOP candidates have a quiet rivalry of their own. O’Neill’s campaign, for example, blasted DuPont for failing to file a financial disclosure form. DuPont hit back by saying O’Neill is focused on the frivolous and not the issues important to the 5th District. Santos, meanwhile, has been promoting himself as the only Republican candidate with political experience. At the end of this primary season, the congressional candidates all had one thing in common, however: their search for votes, one by one. At a campaign stop at the Blue Colony Diner in Newtown on Monday, O’Neill introduced herself to Anthony Faso, who was lunching with a companion. Faso said he was glad to meet the candidate. He surprised O’Neill by saying he has a nephew in Congress, Rep. John Faso, R-N.Y.
“You tell him hello when you get there,” Anthony Faso said. Santos entered the race first, seeking to challenge Rep. Elizabeth Esty, who has held the 5th District seat since 2012. When Esty decided against running for re-election following criticism of how she handled an abusive former chief of staff, the rare chance to run for an open congressional seat opened the floodgates to other candidates. Manny Santos campaigns in Meriden on Monday. Santos, who has raised less campaign cash than any of the other candidates, has spent a lot of time knocking on doors in the district, promoting his experience in government as a former mayor. “I understand that what happens at the federal level has an impact on cities and states,” he said. His strategy has been to concentrate on the Republican-leaning areas in the district, which contains 41 cities and towns. Those GOP areas are the district’s smaller towns and more rural areas. “The majority of Republican votes come from those towns, but we’re not ignoring the cities,” he said. Meanwhile, Hayes is spending her all her free time campaigning. 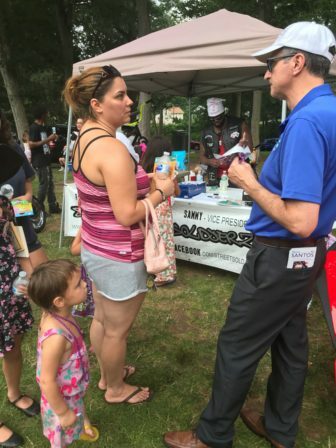 An administrator with the Waterbury public school system, Hayes had been working full-time and campaigning on evening and weekends since she declared her candidacy about 100 days ago. “People said ‘You can’t do that and work,’ but I had no choice,” she said. She took a week’s vacation to be able to campaign full-time and close the deal with voters before the polls close on Tuesday. On Monday, she stood outside Cheshire’s town hall in drenching rain while waving a huge campaign poster. Hayes has not limited herself to Democratic strongholds, like Waterbury, instead spending the final hours of her campaign in more Republican areas, like Farmington, Torrington and Southbury. 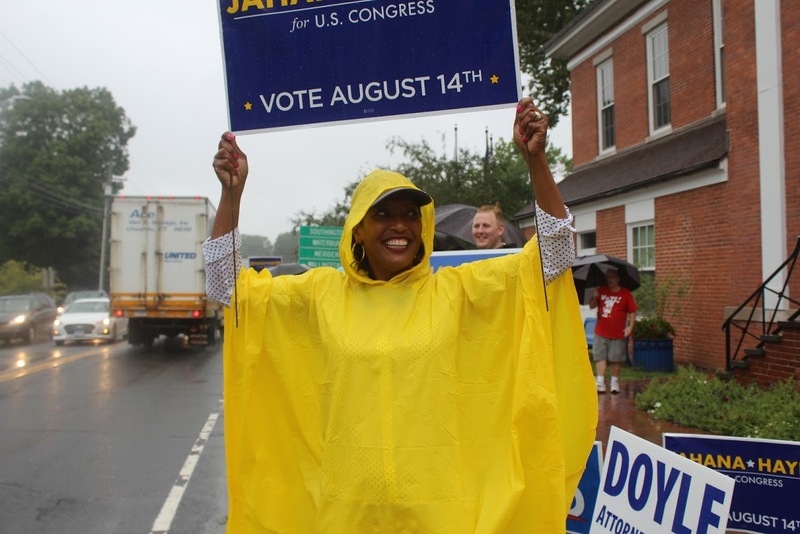 Jahana Hayes greets voters in Cheshire. “Anything I can do to pull it off, I will,” Hayes said. If she wins Tuesday’s primary, and November’s general election, Hayes would be the first African-American woman Connecticut sends to Congress. She said the sprawling 5th District is a difficult one to campaign in, from a geographic perspective. “And it’s a very traditional district, so I didn’t know how I’d be received,” Hayes said. On Monday, Glassman achieved her goal of campaigning in all of the 41 cities and towns in the district. Like Hayes, Glassman said she did not ignore GOP strongholds. “I went to all the towns that I will represent in Congress,” Glassman said. She also kept a promise Monday to deliver food to a New Britain pantry that was short on supplies. She also delivered food to a pantry in Plainville that she heard needed help.